China launched its first heavy-lift Long March 5 carrier rocket late last Thursday, marking a new milestone in the country’s space industry. As China’s first-generation heavy-lift rocket, the Long March 5 has a liftoff weight of 870 metric tons, and a maximum payload capacity of 25 tons to low Earth orbit and 14 tons to geosynchronous transfer orbit. The 57-meter-tall rocket, the tallest in China’s carrier rocket family, thundered away with a blinding white flash from the Wenchang Space Launch Center in the island province of Hainan at 8:43 pm. It ferried the Shijian 17 scientific experiment satellite and a Yuanzheng 2 upper stage, which is capable of putting multiple payloads into different orbits during a single mission. 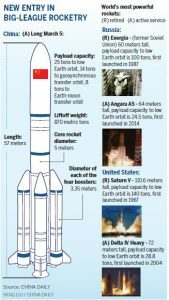 As the nation’s strongest and most technologically advanced launch vehicle, Long March 5 will enable China to put its future manned station into space and send unmanned probes to Mars, according to the State Administration of Science, Technology and Industry for National Defense, which oversees the rocket’s development. China will start launching parts of its permanent manned space station starting in 2018 and put the station into service around 2022. The nation also will send an unmanned probe to Mars to orbit and land around 2020, said space officials. The Long March 5 rocket has two core stages and four boosters. It uses liquid oxygen/kerosene and liquid oxygen/liquid hydrogen as propellants, making the rocket friendlier to the environment than previous Long March types, according to the China Academy of Launch Vehicle Technology in Beijing. Beyond Long March 5, the China Academy of Launch Vehicle Technology has begun to develop a super-heavy rocket that will have a takeoff weight of 3,000 tons and can lift a 100-ton payload into low Earth orbit. If the research and development proceed well, the super-heavy rocket will carry out its first flight around 2030, and then it will enable China to land astronauts on the moon and to send and retrieve Mars probes, researchers at the academy said.